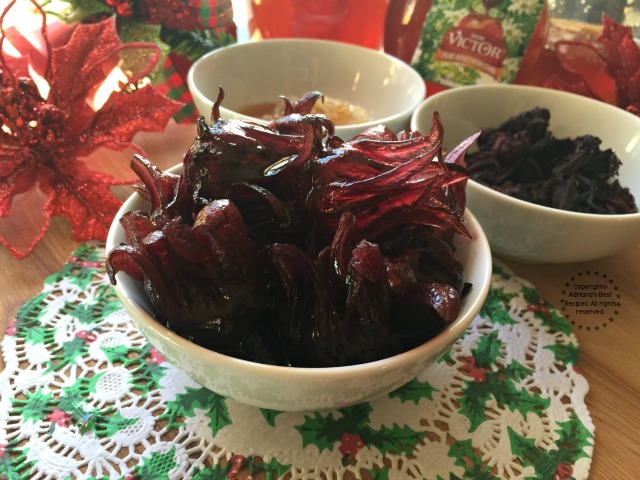 The Hibiscus Flowers in Honeycomb Syrup are great for handmade gourmet gifts, for appetizers and to add to cocktails. 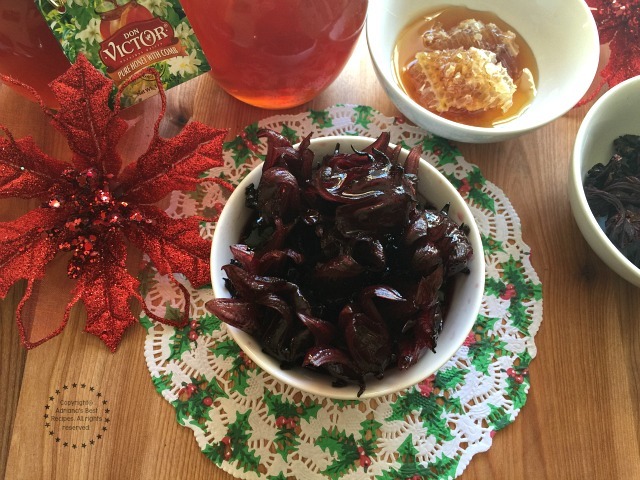 This Hibiscus Flowers in Honeycomb Syrup are great for handmade gourmet gifts, for appetizers and to add to cocktails. Both hibiscus and honeycomb are edible and are perfect ingredients to surprise your family and friends this holiday season. Ingredients for the Hibiscus Flowers in Honeycomb Syrup. 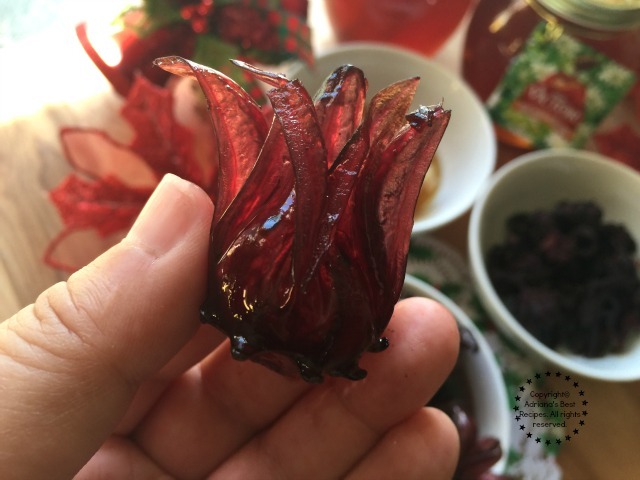 I do enjoy preparing handmade gourmet gifts for my family and friends and canning is a great way to do that so having recipes like this Hibiscus Flowers in Honeycomb Syrup is a great idea. 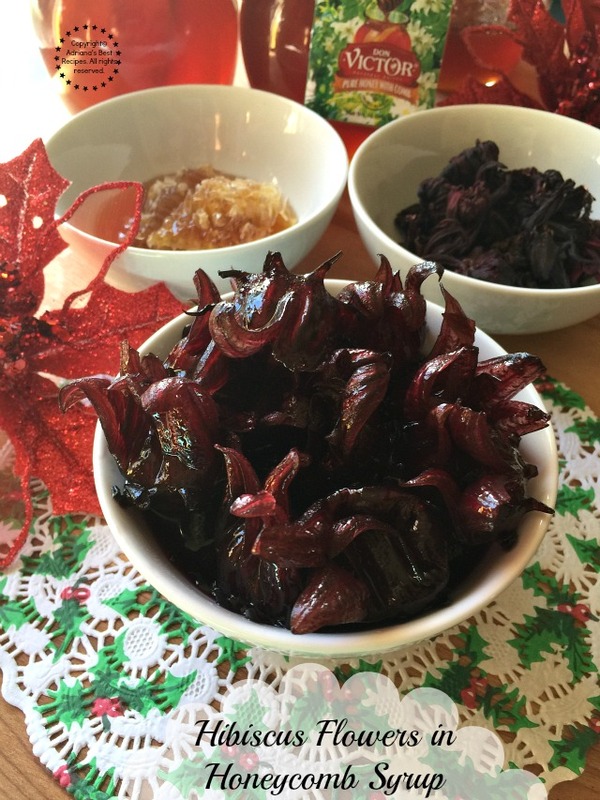 Besides the also called hibiscus or “jamaica” flower is a Mexican cuisine favorite. On a saucepan add the hibiscus flowers. Add the honey and the honeycomb. Cook for 30-45 minutes until a syrup is formed and the flowers are tender and soft. Can the Hibiscus Flowers in Honeycomb Syrup and enjoy in appetizers, for garnishes and in cocktails. 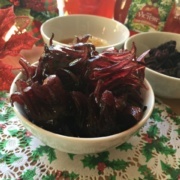 Aside form the fact that could become a precious gift since it is very unusual to gift hibiscus flowers and yet have them cooked in honeycomb syrup and ready to use. The honeycomb and the hibiscus flowers are edible. There are many edible flowers that we can use for special occasions like the holidays. Time when we need new ideas for appetizers or for entertaining at home. 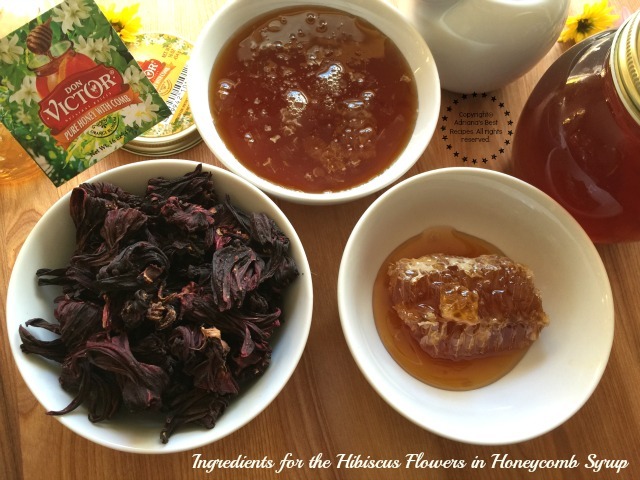 Cook the hibiscus with the honey and the honeycomb until tender. Gifting gourmet gifts allows people to prepare special bites when hosting a party at home. Ready to use Hibiscus Flowers in Honeycomb Syrup. 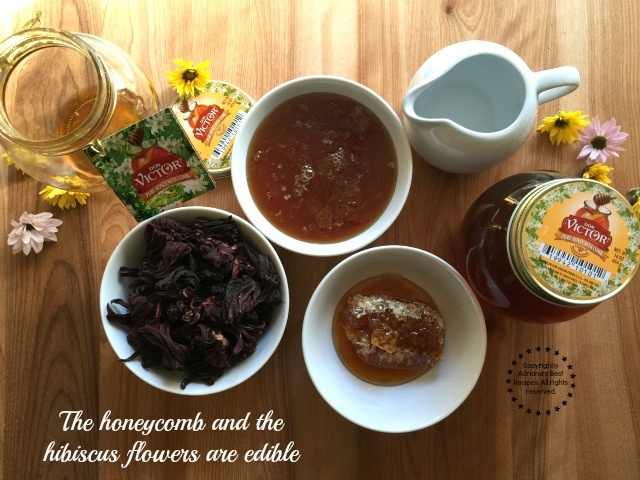 And my recipe for Hibiscus Flowers in Honeycomb Syrup is perfect addition. These flowers are versatile and you can use for beautiful appetizers, stuffed with cheese, for garnishes to cupcakes and special desserts and also to use for crafting cocktails and to add to champagne or sparkling soda. Watch the video to get inspired! Having something special is what makes the holidays such a wonderful time. And with Don Victor Honey you can certainly prepare many special dishes and also use the beautiful jar for canning or give honey as gifts as part of those Christmas baskets you put together. Don Victor Honey is raw, filtered honey, not processed in any other way. 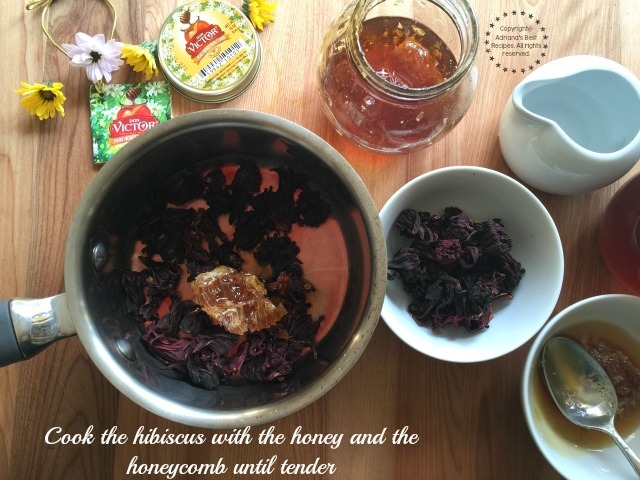 The honeycomb that comes inside the jar is perfectly edible you can pair with cheese for a gourmet experience, add to biscuits, eat as a treat and use on my recipe for Hibiscus Flowers in Honeycomb Syrup. Find Don Victor Honey at Walmart! 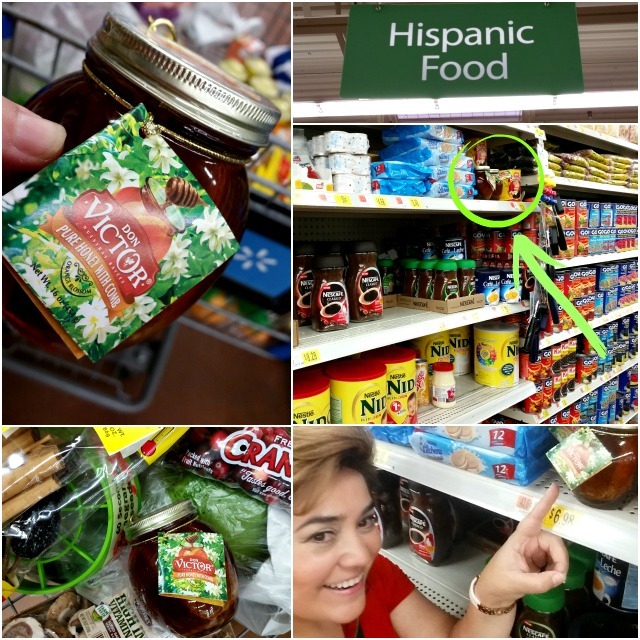 And you can find Don Victor Honey at Walmart in the Hispanic products aisle. Honey never goes bad you can store in your kitchen counter. If you see your honey is getting some crystallization this is the natural process it is not an indicator of spoilage, impurity, age or quality. Hibiscus Flowers in Honeycomb Syrup perfect for appetizers and cocktails. If your honey crystallizes, simply place the honey jar in warm water and stir until the crystals dissolve, or place the honey container into near boiling water that has been removed from the heat. Visit Don Victor website for more details. You can also follow them on Facebook to get latest news and recipe ideas. Wow, haha! That is so unique! What a fun interesting gift! Wow…I have never eaten a hibiscus flower but I am now intrigued. What a lovely homemade gift to give for the holidays. Add this to the list of things I’ve never eaten. Didn’t realize it was an option! Beautiful photos! I love the hibiscus flower but never thought about eat them. This is a culinary trend you can eat them like cherries the texture is the same but the flavor is sweet and tangy. You can eve stuff them with cream cheese and use for dessert garnishes and in cocktails. I have never try this before. Look so interesting I have to try them. They are sweet and tangy very nice flavor. Nunca he tratado ni visto una receta así Debe de saber delicioso. Tus recetas son espectaculares. Luce maravillosa esta receta, tengo que intentarla! I’ve never eaten flowers before, but from the looks of these I’m dying to do so. They are so pretty too! Que ricas se ven esas hibiscus flowers! They looks so cute too!! These sound wonderful, I’d love to try them! Además de que se ve deliciosa la receta.. Me encanta la presentación. Fotos de revista… Me encantan. I think I’ve heard hibiscus before when I was a child? But never seen it, I’m so curious what it taste like. Se ve delicioso Yummy! Muchas gracias por la receta! I’ve always wondered what to do with that honeycomb in the honey jar. I didn’t realize you could eat it… don’t know why! Wow, this looks amazing! I have never had anything like that but it sounds delicious! Must try soon! This is something I have never tried in my life but it sounds interesting. I will have to try these for sure. Thanks for the recipe.